“Yar: Easy to handle and moves along smoothly.” This witty archaic word to describe a “proper yacht” in “The Philadelphia Story”—the memorable Hollywood film from 1940—is a fitting one-word designation for the 123-foot (37.3-meter) cutter-rigged sloop Pumula from Royal Huisman. 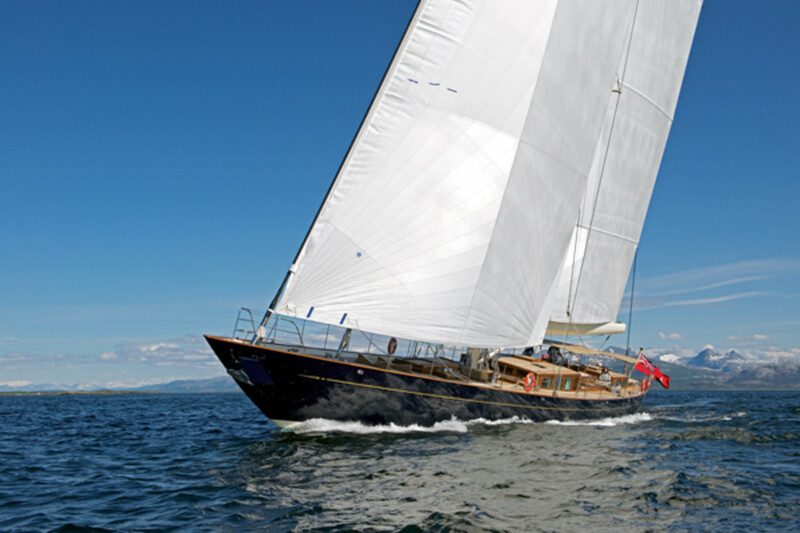 Royal Huisman’s Pumula is a fully modern build with a tip of the fedora to the Gilded Age. “Yar: Easy to handle and moves along smoothly.” This witty archaic word to describe a “proper yacht” in “The Philadelphia Story”—the memorable Hollywood film from 1940—is a fitting one-word designation for the 123-foot (37.3-meter) cutter-rigged sloop Pumula from Royal Huisman. 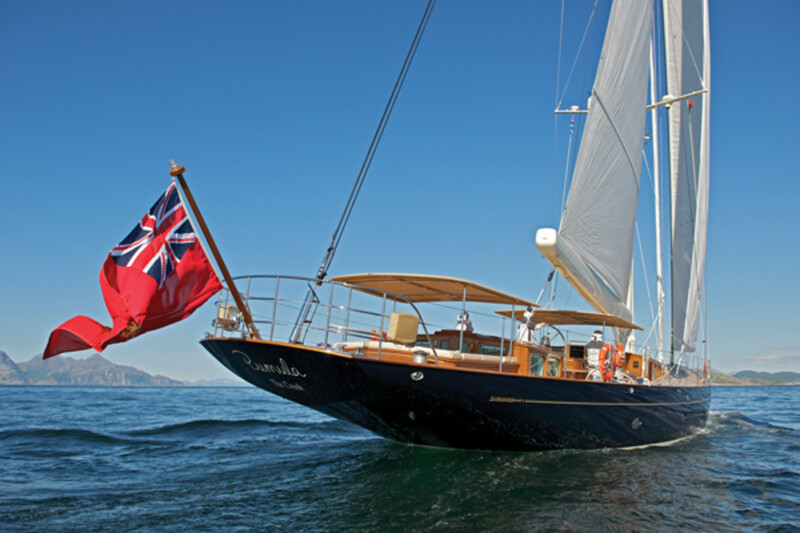 She sails well and is perfectly proportioned with impeccable sheer, long overhangs, teak decks and teak-clad deckhouses. Pumula is as blueblood, mainline and patrician as the character Katherine Hepburn portrayed in the classic film. 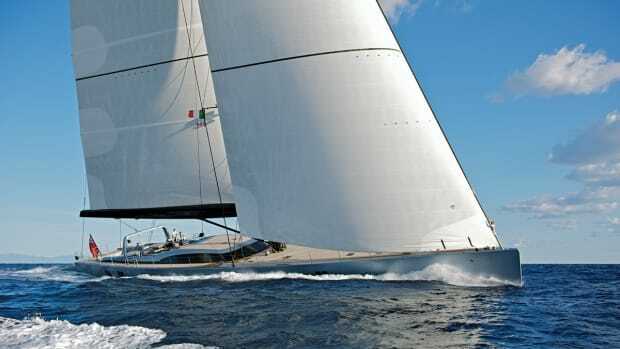 In fact, Pumula’s owners’ build-and-design brief specified “a true sailor’s yacht, one that looked right and sailed right.” The owners had the perspicacity to hire just the lineup to give them what they wanted: Royal Huisman, with an outstanding pedigree that exceeds 125 years of shipbuilding, is certainly one of the finest sailing-yacht builders in the world. 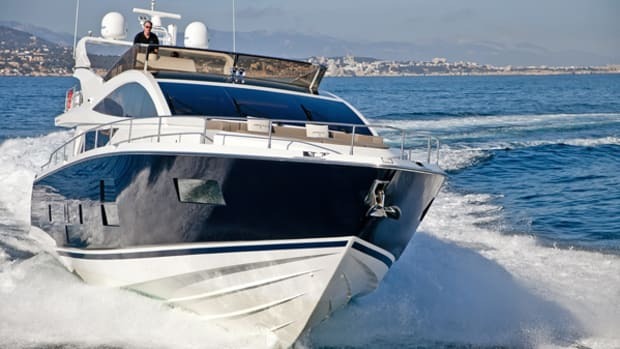 Dykstra Naval Architects enjoys world acclaim and, among other attributes, has a reputation for melding classic design with modern technology. And, in combination with veteran owner’s rep Jens Cornelsen as project manager, and Rhoades Young Design for the interior, the dream team was complete. 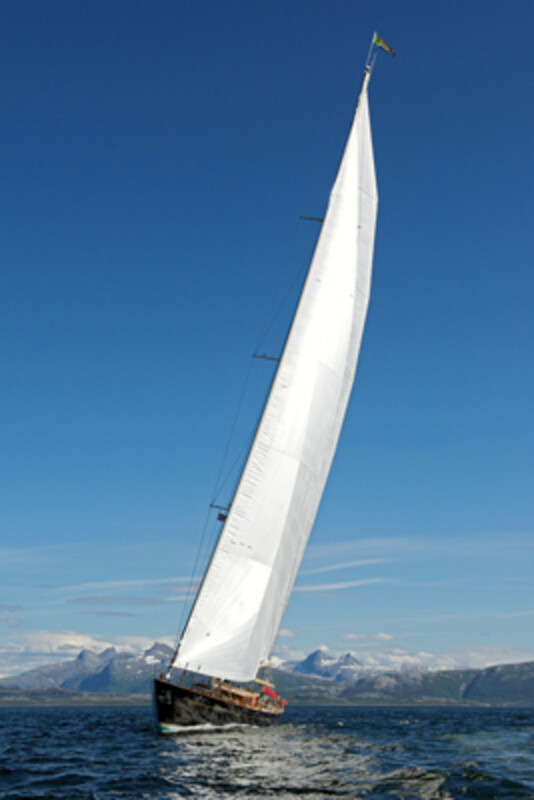 The result is a sailing yacht without compromise. Pumula is a true ’round-the-world vessel; no Caribbean-to-Med boomerang circuit for this boat was ever intended. 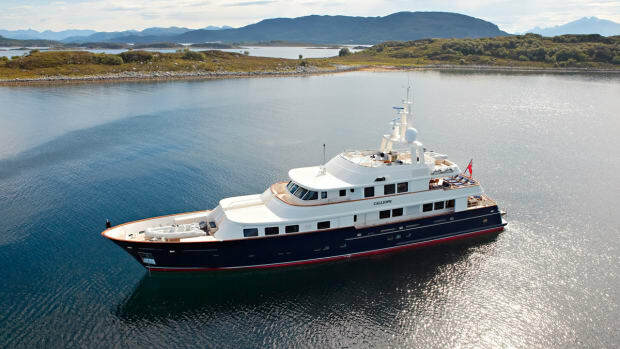 Strictly private and not available for charter, the owners logged more than 12,000 miles her first year. The captain has great tales of spotting polar bears in Spitsbergen and formidable fjord travel in Norway. Dykstra designed the underbody of the boat with a fully ballasted and retractable bulb keel that extends to 16 feet 5 inches (5 meters) for maximum windward traction and lifts to just under 10 feet (3 meters) for access to shoal draft anchorages. Her aluminum rudder is configured as a deep semi-spade. She is massively strong, and while the captain navigated around—and not through—ice floes, he was not overly concerned about Pumula being capable of handling the far northern climate or conditions. After her more adventurous cruising, Pumula sailed to the Caribbean and then up to Florida. I caught up with the boat and crew in Palm Beach. 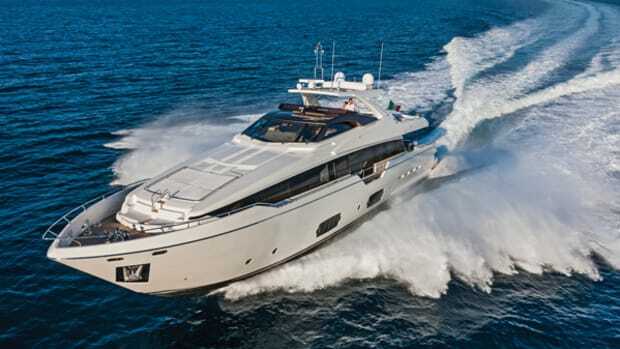 Too often, a yachting journalist is relegated to viewing a yacht when it is dockside. However, a sailing yacht must be experienced at sea to be fully appreciated. 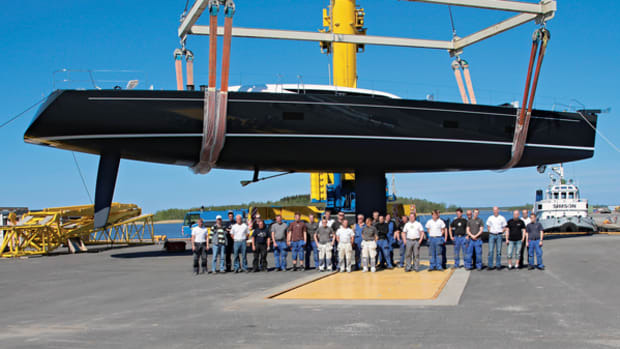 I was fortunate enough to spend a day with Royal Huisman’s Mike Koppstein and Jurjen van ‘t Verlaat and the captain and crew of Pumula doing what the yacht was meant to do—sail. Pumula sports a traditional single helm, and since I was encouraged to try her out, I can attest to the boat being balanced and easy to handle. Plus, there is no visual intrusion of screens and monitors around the helm, as they were designed to be discreet until desired. I was also impressed by the good visibility over the main deckhouse, which was kept purposely low. The owners intend to travel extensively with family and friends. 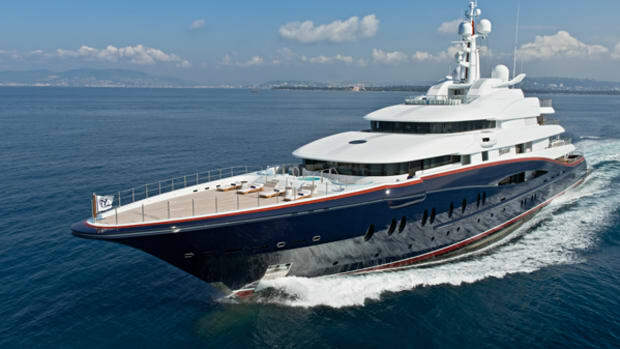 Seeking simplicity, they did not want a megayacht that required a ton of crew and a plethora of technical equipment. 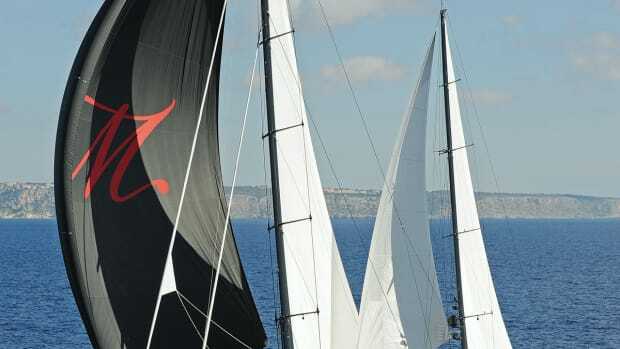 The large sail plan of 8,439 square feet (784 square meters) is designed to ensure good light-air performance. 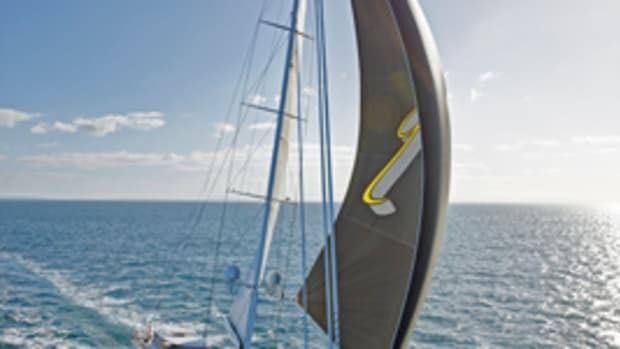 And the boat can be sailed effortlessly by two people, thanks to sail-management systems that include captive winches for the mainsheet and halyard, hydraulic boom furling and furling headsails. The boat truly is responsive in light or heavy air. We moved comfortably along at 10 knots in fairly light air. The boat runs effectively with a small crew of four. Captain Michael van Bregt and his wife, Charlotte—who is also a sailing master, chef, chief stew, purser and sometimes varnisher—joined us for a breakfast briefing before the sail. 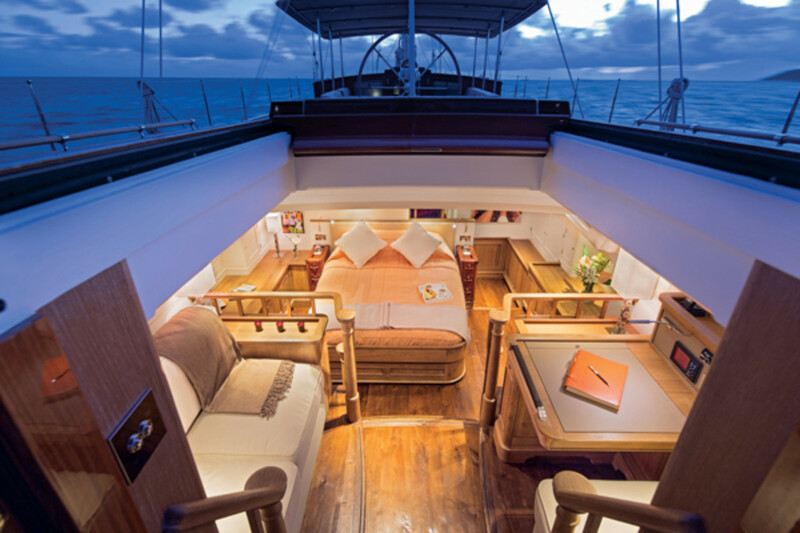 The couple has been with the owners since the build of this yacht. They explained that when the owners started the build project, they had a thick file folder of clippings—other boats they admired as well as articles on potential places to visit. The Van Bregts and the owners often have open chats about where Pumula should cruise over the next five or 10 years. Prior to Pumula, the owners had a 72-foot (21.9-meter) Jongert, which whet their appetite for sailing, but also informed their decisions on what they wanted with their custom-built yacht. For instance they wanted to be closer to the water and to actually feel the trim of a sail. Having a classic design with low freeboard and nearly flush decks gives them that immediacy to the water, and the carbon rig, sail power and underbody configuration help yield the performance they were seeking. 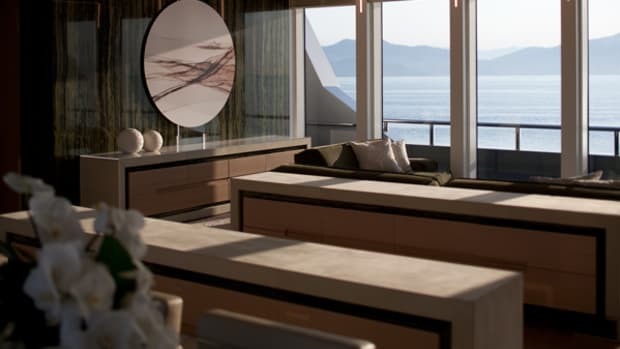 The interior accommodation includes an owner’s suite with its own deckhouse/study and private cockpit, two guest cabins aft, one forward cabin, a large bright galley and two crew cabins, also forward. The common areas comprise a lower salon and bar, raised-deckhouse dining and an ample main cockpit, also used for dining. While there is plenty of exquisite wood finish, much of the interior paneling is painted white, reminiscent of the classic Herreshoff tradition. The gentleman’s yacht theme is ever present with the exception that the overall effect is not dark and heavy. Noteworthy is the slightly distressed-looking light-oak cabin sole that has a waxed finish, which provides a sense of lived-in comfort. There are many singular touches such as the saddle-stitched-leather bedside tables reminiscent of luggage from the Gilded Age and the storybook quality of the décor. Pumula will be creating her own storybook over the years as she continues on her journey. According to Van Bregt, the owners treat the crew with respect and, likewise, the crew enjoys a very friendly interaction with the owners. “If the weather is not suitable to go somewhere, we don’t go, “ Van Bregt says. The owners also are aware of what it takes to keep the boat well maintained and looking spiffy. While the owners enjoy their time on board, they are mindful of a program that includes maintenance and varnishing. From my point of view, she was quite the boat…was and is very yar.